For These Cosplayers, Geeky Costumes Are The Cat's Pajamas Cosplay has been a fixture of the Comic-Con world for more than a decade. Should our pets be embracing the geekery, too? Some of the 50 costumes cat-cosplay.tumblr.com has released. 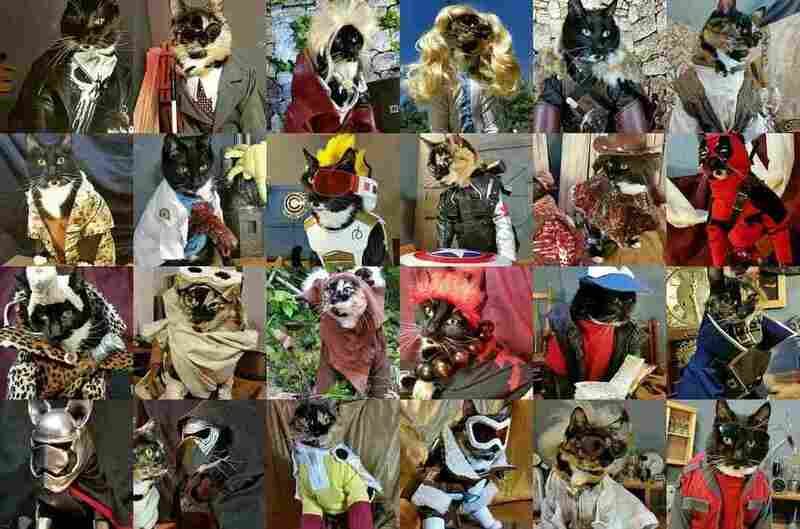 Their creator, a Seattleite who goes by Freyu, began costuming his cats six years ago, for a Renaissance fair. This weekend, San Diego will be invaded by comic book characters, all 12 Doctor Who doctors and lots of Lycra. The normal sights of Comic-Con International weekend, of course. Many enthusiastic Comic-Con-goers opt to dress in cosplay — for the uninitiated, that's a mashup of the words "costume" and "play" — inserting themselves into their favorite stories. Meanwhile, two cosplayers in Seattle are avoiding the San Diego heat, staying at home instead and refining their art. Nak, 13, and Fawkes, 6, have been cosplaying for a little more than a year. They've been ambitious. Their social media pages show off more than 50 geeky costumes: Alien, Star Trek, Fallout and Game of Thrones each make an appearance. During the year they've been active, they've gained a sizable following with nearly 10,000 followers on Twitter and 18,500 on Instagram. Their owner, a Seattleite who goes by Freyu, began costuming his cats six years ago, for a Renaissance fair. He found a dog-size pirate costume at a pet store and put it on his cat, who liked to ride around on his shoulder. People loved it, running up to the cat, petting it and asking for photos. But Freyu, with a background in costuming and theater, was underwhelmed by the costume. "I hated the way that the costume was so fake," he says. "By the next weekend of the Renaissance fair, I had made a dragon costume with full metal scales and articulating wings." The wings were hot, and people couldn't stop staring. Wanting a challenge, Freyu decided he could do more with cat costuming. He began crafting sports apparel for the cats and showing up at Seahawks rallies. He posted the costumes to the NFL section of Reddit, not thinking much would happen. Soon he was, as he says, "a minor celebrity on NFL Reddit." He learned something very quickly — people loved costumed cats. "[The NFL costume] was so popular I sort of got in my head, you know, I'm going to try a few other things," he recalled. "I launched us on Twitter, Instagram, Tumblr and Facebook, kind of all at the same time, and started doing costumes and it sort of blew up from there." As the follower count grows, costumes become more ambitious. Sometimes, Freyu doesn't know where to start with costumes and figures it out as he goes, remeasuring and editing until he gets the desired effect. No project is too big, too out of the question. However, he notes that there's definitely a learning curve when it comes to pet costumes. Have you ever thought about putting a jacket on a cat? It's not so simple. "There's so many different things that you have to realize, like the fact that they don't have shoulders," he said. "In any costume that has any sort of shoulder stuff, you have to adjust it so much for a pet. Getting some of that stuff to translate when you're making the pattern can be quite challenging, especially for open jackets and open vests." The recognition for the costumes has been rewarding, in more ways than just Internet street cred. The cats are sponsored by Loot Crate, a mailing service that sends subscribers a box of geeky paraphernalia every month and offsets the cost of production. This means that Freyu, Nak and Fawkes can maintain a steady flow of costumes in the future. Despite the demanding nature of his full-time job, Freyu plans to keep working on the cat-cosplay website, expanding his sewing skills and taking on more difficult costume projects. Maybe someday he'll work with a company on his own pet clothing line, but for now, he's happy with how things are going and believes he remains true to the original motto of cat cosplay. "If I can make one person smile a day, then the hours and hours — and some of these take 40 to 50 hours to make — but all of those hours are worth it if I can brighten somebody's day and bring them back from having a bad day with my silly little pictures." Micaela Juliána Rodríguez is an NPR intern.